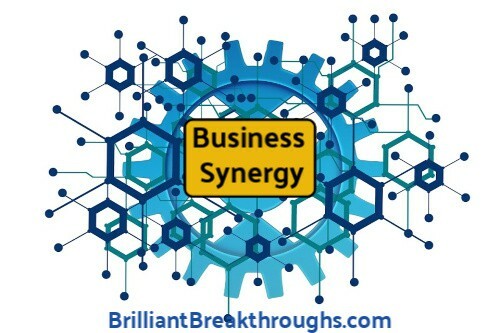 What's Business Synergy? - Brilliant Breakthroughs, Inc.
Home › Goals › What’s Business Synergy? 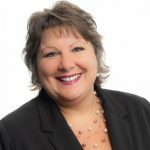 Is your business synergy in sync or disconnected? Here’s options to consider. Business synergy is for Small Businesses too? It was only 15-20 years ago when the term synergy explained how big business collaborates. You, as a Small Business Owner (SBO), are most likely implementing synergy into your business already. I’m convinced this is the fuel to keep small businesses thriving! I believe this is how SBOs amplify their business. If you aren’t collaborating you may want to spend some time thinking about how to become more efficient, while simultaneously improving YOUR Business Performance. Over-simplified, synergy is the concept that the whole is greater than the sum of its parts. Essentially, this means you get something greater when collaboration occurs. As you are diving into assessing what YOUR Business needs to succeed, why don’t you assess if there is a synergistic opportunity waiting for you to implement? Chances are you can begin strategizing one with minimal effort. According to Robert Kreitner, there are 4 Types of Business Synergy: Market, Cost, Technology, and Management (2001, pp. 203 – 205) you can create business synergy in the following four manners to give YOUR Business a competitive advantage. This occurs when one product or service strengthens the sales of another. If it is successful, you don’t even think of one without the other. Example 1: Your (land and/or cell) phone, cable, and internet services are probably bundled. Once upon this wasn’t the case. AT&T bought up and then bundled these types of services into one product for you. Example 2: Gas stations and convenience food. (This didn’t exist in the early 1980s.) Many gas stations have snacks to walk out with. Some now have fast-food restaurants within the gas station. Wouldn’t it be boring if you could only get gas at a gas station? This occurs when processes, products, and/or equipment can be used for at least two different situations. Example 1: A certain brand of cereal could be the name brand OR it’s also packaged as a generic brand. I know some plant managers of facilities that did this type of production. Exactly the same product, just different packaging for the customer. This instantly minimizes costs and increases profitability for company. Example 2: Farmers do this every day. Farmers found a way to have their livestock’s waste benefit the production of the crops by utilizing it as manure. Even though this stays in one production system, it does minimize waste removal costs for farmers. Example 3: Kreitner shares how McDonald’s restaurants provide their used oil to those who are seeking alternatives to fuel. When McDonald’s do this, they are cutting their used oil disposal costs. This is when a technology is transferring its applications from one to another. It creates new opportunities for profit boosts for all parties. Example 1: Software Development and coding has shifted from coding for operating platforms to apps. Oh, and let’s not forget video games. Example 2: Music being multi-purposed from creators to movie themes or even video game scores. This occurs when a management team is complementary instead of homogeneous. This ideal situation has minimal to no duplication of skills and capabilities. This is casually dubbed, “Divide and Conquer”. Example 1: When a management role is good with people and another has excellent financial understandings. Example 2: A manager is needing assistance or the project may be canceled. Then, another manager appears with the capabilities to fill the gap. If the two work together, they can create something better than what either one could do alone. The key here is that there’s complementary capabilities with the management team. Business synergy is a great approach to strategize for long-term success. Will you implement each of the above immediately? I sure hope not! Why? Each type requires concentrated effort and resources. Do pick the one synergy type which you believe will have the most impact with the least resources available to you. These synergies don’t happen over night. Remember this is for long-term success: Make sure your revenue stream is strong before you dive into these fast moving rapids. Selecting the right synergy to implement will improve YOUR Business’s Success Rate. Feel free to share what business synergy may be your first choice in the comment section! THANKS FOR ALLOWING ME TO HELP YOU IMPROVE YOUR BUSINESS! P.S. : Create brilliant outcomes through making better decisions in real-time. Copyright: Article is copyrighted by Brilliant Breakthroughs, Inc. The internet is about sharing. Please share this post in its entirety with full attribution to BrilliantBreakthroughs.com.